Door omstandigheden kunnen wij helaas geen emails meer beantwoorden. Voor vragen, ook over de verkoop van schaakcomputers uit de verzameling, kunt u contact opnemen via www.schaakcomputers.nl. Owing to circumstances we are not able to answer your questions. For all questions, information and the sale of chess computers from the collection, please contact www.schaakcomputers.nl. 1. Qd1xh8 Ng8-f6 (the knight was attacked) 2. Nb1xg7+ checkmate! Since 1979, many more chess computers have been added to the collection. But never did I waste so much time on any chess computer as on this contraption. Unfortunately, it never produced any gems of genius. Of course, I should have known better, but occasionally I hoped the machine would still turn out capable of making intelligent moves. In order to encourage it in this direction, I sometimes allowed it to think all night ... just to find another disappointing move on its display in the morning. Still, chess computers kept fascinating me. The second chess computer I bought had an almost human trait: a voice. Victories acquired an additional dimension when games were concluded with a mirthless mechanical voice saying I lose. To be honest, I preferred chess computers to human opponents: they didn't blow smoke into your face, utter unsavoury noises, or exhibit the other repulsive habits with which some chess club regulars try to intimidate their opponents. Adding new computers to the collection continuously allowed me to play against fresh opponents -- although it never turned me into a chess champion. At the moment, the collection comprises 411 chess computers, 185 of which are specially designed for travelling. The oldest computer in the collection is Chess Challenger 1 (named after the fact that it has only one playing level). 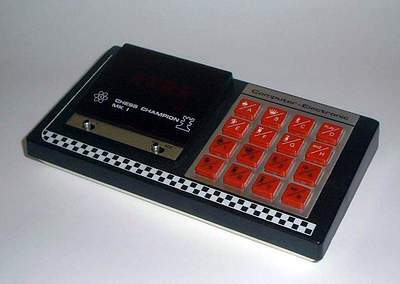 It dates from March 1977 and was the first commercially available chess computer. It did, however, have such serious flaws that within a few months buyers could exchange their computer for the Chess Challenger 3. There are a number of candidates for the title of most spectacular item in the collection. First there are some computers that move their own chessmen, such as Milton, which moves its own chessmen via an magneto hidden under the board. A comparable machine was produced by Excalibur in 2007 under the name of Phantom Force. A film featuring this computer can be seen here. In 1982 manufacturer Novag produced the Robot Adversary, a computer that moved its chessmen with a robot arm. Only few working specimens are left. No wonder it has fetched steep prices at eBay. Until 2008 the Overtom Museum never managed to acquire this computer. In that year Novag came with a re-make of this machine, the 2Robot, which was less costly, so that finally one robot has been added to the collection. A third computer that looks quite exceptional is Disney Magic Castle. It was manufactured in 1988 by Novag and was commissioned by the Walt Disney Company. The story goes that the programmer was ordered to weaken his initial program so that it would be easier for the young ones to beat it -- the only chess computer intentionally made weaker! Finally the strongest computer. A Dutch computer which recognizes its own chessmen is TASC R30, a computer that with its Elo rating of over 2350 can only be beaten by the strongest players. Several times, non-existing TASC computers have been offered at eBay by swindlers. A special page dedicated to this kind of scam can be found here. The collection has been arranged into eight groups: the seven main manufacturers and the rest. Within each group the computers have been arranged alphabetically. CXG, also known as Newcrest Technology. They have produced a number of fine machines, not in the least because of Frans Morsch, the Dutch programmer of the renowned Fritz program. Unfortunately, in the early 1990s, this factory closed its doors. Excalibur, founded in 1992 by Shane Samole, the son of the Sid Samole, who had produced the first commercial chess computer. Excalibur's engineering department is led by Ron Nelson, who had also programmed most of Fidelity's Chess Challengers. Fidelity Electronics, which produced the first commercial chess computer, Chess Challenger 1. In 1989 the factory was sold to German Hegener und Glaser, the makers of the famous Mephisto chess computers. Novag, which from times immemorial has produced solid, no-nonsense machines. 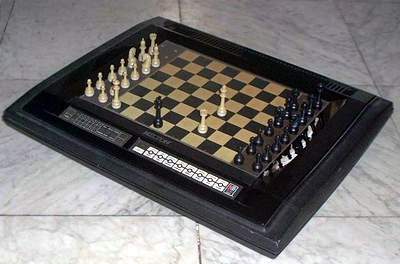 Not only has Novag made an extensive range of chess computers for the beginner, but it also caters for the stronger player with machines like Obsidian and Sapphire. As you can read at Mike Watter's site, Novag and Scisys started producing chess computers as partners. Mephisto has always aimed at making the strongest machines in the market. Still, it can be wondered how many people are prepared to pay huge sums of money for a machine that they will never be able to beat. Mephisto has been taken over by Saitek. Scisys has been producing a large assortment of not too expensive machines. These days, the company is known as Saitek. As can be read above, Saitek took over Mephisto in 1994 and produces a range of chess computers under this name. Most of the chess computers of Tandy (Radio Shack) have been manufactured by Scisys/Saitek. The Tandy and Radio Shack collection is so extensive that they will be presented separately. Finally, there are several names such as Krypton, Lexibook, Millennium, Orion, Tiger, etc. They are taken together under the name of Miscellaneous. Some technical information shown here has been derived from German site Schachcomputer.info. Some dates of production have been taken from the TimeLine shown at Chess Computer UK. By the way, if you're interested in the history of computer chess in the United Kingdom, you should click here. I would also like to thank Hein Veldhuis, who provided me with much useful information. Finally my thanks to the PC Dokter, from whose staff I received good technical advice. If you have a very special machine and you don't really use it, don't hesitate to get in touch with the museum (click). Click here to go to the collection. if you want to see how the files of the museum are made, you may click here.